Users should have the option of buying complete systems, barebones configs, or just the motherboard. We could see cases offered by multiple enclosure makers, too. The initial system will arrive in the third quarter of this year and cost $400. Inside the box, you'll find a mobile Core i3 processor paired with the HM65 chipset. USB 3.0 didn't make the cut for this version, which will feature three USB 2.0 ports in addition to dual HDMI outputs. Audio will be carried over HDMI, and we can expect 4GB of RAM, a 40GB mSATA SSD, and both Wi-Fi and Bluetooth connectivity. The motherboard has dual SO-DIMM and mini PCIe slots, so there's some freedom to mix and match components. This first version is just the beginning. In the fourth quarter, we can expect another configuration with a 7-series chipset, USB 3.0 support, and Thunderbolt connectivity. The platform is designed for 17W CPUs, and Intel is planning variants with Core i5 and i7 processors. 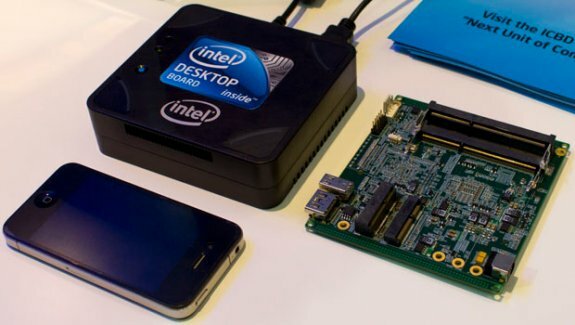 A cheaper, Celeron-based version may be offered, as well. Full details at The Tech Report.